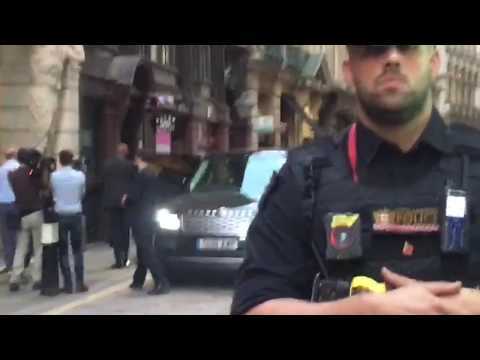 A crowd of people shouted “shame on you” at Prime Minister Joseph Muscat and his wife Michelle as they made their way into a hotel in London which was to host a gala event to promote the sale of Maltese passports. Footage shows the couple being escorted inside the building, with a small scuffle taking place as a man with a camera approached the two. Campaigners yesterday protested outside a gala dinner event to promote Malta’s individual investor programme. A number of activists showed up with signs and placards, while a masked man with a megaphone 'advertised' Malta's IIP scheme. The Prime Minister has been under fire this week as new revelations emerged about Tourism Minister Konrad Mizzi and Keith Schembri as part of the Daphne Project, investigative reporting carried out by a consortium of media outlets.